We have a new kooky little game we play here now that we know that the covert composter works. We call it Will It Compost? 1. Dog fur tumbleweeds from Blitzkrieg’s hairbrush. 3. Dirt from the Roomba. 4. A 100% white cotton sock. 5. Corn-based plastic coffee lid from a paper take out cup of coffee. Husband and I threw it into the compost bin just to see if it would compost - it did! 6. Wine Corks. Obviously, I'm talking about composting wine corks made from real cork instead of the fake corks that are made from plastic. 1. Fallen eucalyptus leaves and branches from a wreath. 2. Citrus peels. They are too acidic. 5. Dog and cat poo. 6. The bodies of my enemies. Tempting, but no. Remember that episode of Bones where they found the murder victim and enough evidence to convict the killer because the killer was too dumb to realize that you shouldn’t put meat (for lack of a better term) in a compost heap because it will make the compost smell and possibly attract animals? Besides, murder is soooo tacky! What unusual things have you tried to compost? Did it work? Awesome haiku, and now we know :) Really, I do feel like I learned something here just now, and I had fun, too. Glad to hear it Maggie! That's what life in The Condo is all about, wacky but informative! Interesting post. Glad you aren't hiding bodies in the compost pile. I couldn't feature your Adoptic snippets on my blog if you did that. The corn products composting thing is a great thing. I am afraid to compost anything; I fear rodents. But I have much respect for others who do. Perhaps at some point, we might join the compost camp, too. Welcome to my blog, by the way. Fun blog you have. I do like your blog. 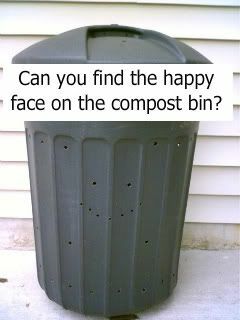 Because I am in a new house (for me) and putting in a new vegetable garden, I wanted a simpler way to make my compost. You have a very good idea! I am sorry , though because I can't help myself from pointing out that citrus "peal" is actually spelled "peel". Now to return the 20 gallon tub for a larger one.